Women in their 40s are more likely to drink potentially harmful amounts on a night out than younger people, researchers in Cardiff have found. While men's drinking peaked in their late 20s, women's alcohol intake reached its heights among the over-40s. In a year, 893 people were breathalysed late at night in the city centre for the Cardiff University study. 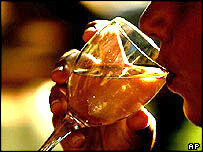 It found 40% of men and 20% of women had drunk over a level which put them more at risk of injury and ill-health. Researchers said their findings came as "something of a surprise". Binge-drinking is defined as eight units for men and six units for women, which is twice the daily recommended alcohol intake. Professor Jonathan Shepherd said the survey, funded by the Alcohol and Education Research Council, had shown a "clear difference" between men and women's drinking patterns. In men, blood alcohol concentration was highest in 29-year-olds, but then tended to decrease with the age of those surveyed. But in women, the levels continued to rise with the age of respondents, with levels peaking in the over-40 age group. Prof Shepherd said: "It's hard to explain and raises a whole lot of other questions. "We speculate younger women have more responsibilities at home, and once the children have left home, then the sky's the limit. "But to be honest, we don't really know why." He said underage drinking in the city centre late at night "wasn't really an issue". "What was more surprising was that students, unemployed people, young adults, had lower alcohol levels than older people and employed people." Younger drinkers, students and the unemployed are not the most "at risk" groups for heavy drinking. Drink consumption affected people's ability to recall how much they had drunk - "a key policy objective should be to keep intoxication levels below the point at which drinkers cease to be aware of consumption". Prof Shepherd said the findings supported the idea that the way to control heavy drinking was to put up alcohol prices. "The reasons students and the unemployed didn't feature much, or have higher alcohol levels was because they couldn't afford it," he said. "Our research also found that after a certain point, people lose track of the amount they have consumed and therefore need other people, such as police, bar staff or friends to prevent them drinking more." A team took to the streets of Cardiff on one Friday night and one Saturday night a month for 12 months, and drinkers were asked to take a breath test. Dubbed the Lion's Breath project, the initial findings were released in April 2006. Speaking as the final conclusions were published, Prof Shepherd said the findings had revealed a better picture of binge drinking in the capital than expected. He said: "There's good reason to think that other places are worse, and that Cardiff is doing well in this regard, but we could obviously do better." The research team was headed by Prof Shepherd and Dr Simon Moore of the university's Violence & Society Research Group. Should there be a minimum price for alcohol?